Not so long ago I came across called a magazine called ‘Kon’. It is a publication that focuses exclusively on Cambodian cinema. It is a cinema I am not particularly familiar with, and so I read the magazine with some interest. I found it even more interesting that it was produced by students from Royal University of Phnom Penh. This effort was guided by Dr Tilman Baumgärtel. 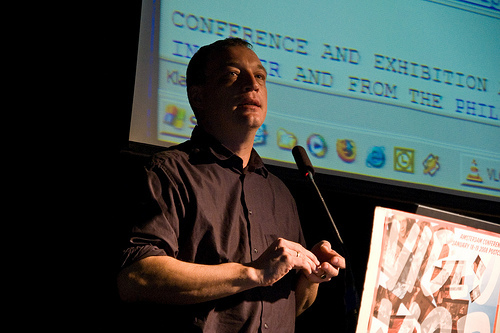 He is a German media critic, who has written extensively about independent cinema, net art, digital culture and, most recently, about the cinema of Southeast Asia, where he has been living since 2004. He taught film at the Film Institute of the University of the Philippines Diliman in Manila from 2005 – 2009, and is currently a professor at the Department of Media and Communication at the Royal University of Phnom Penh in Cambodia. You’re the supervisor of the film magazine, ‘Kon’. Why have you decided to get involved in the publishing of this magazine? When I started to teach at the Department of Media and Communication at the Royal University of Phnom Penh, I felt that the subjects that the students were asked by their supervisors were regularly the social ills and the gruesome past of Cambodia: the Khmer Rouge, poverty, ecological and economical problems, and so on. These are very relevant topics, no doubt about it. However, when I got a budget to do a student research project and to have it printed, I thought it might be a welcome change to work on something that would allow for positive identification with the country. The short-lived, but very interesting film industry of the country in the 1960s and 1970s seemed to be such a topic. As a film scholar, I also felt that too little research had been done on this subject. There are only two academic essays on that subject so far, and that just does not do justice to the rich and amazingly diverse film culture of the time. ‘Kon’ is not an academic publication, but a magazine, but we unearthed so much material and I found much more since we finished the magazine, that I am contemplating to do a book on Cambodian cinema. When we started, we kept hearing there was no material left at all, that the printed source had been lost, but it just is not true. 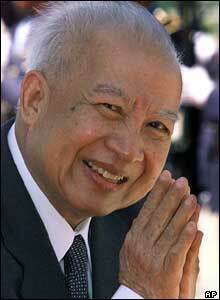 You’ve even managed to secure the support of the King Father, Norodom Sihanouk. How big is this project, and how has the reception been so far? The scope of the project was 20 hard-working students, and a hopefully useful instructor, and a budget to print 1500 copies in color. I cannot praise my students enough for their work on that project; they found contacts, interviewed surviving directors and actors, and a group of them even came up with a design which I find appealing. Again, we came up with much more material then we could include into the magazine. The letter of His Majesty was kind of the icing on the cake, a kind of reward for our hard work. Norodom Sihanouk was a prolific filmmaker himself, and I guess that´s why he supported the magazine, even though he has abdicated and does not give interviews anymore. The staff at our department was taken aback, when the messenger from the Royal Palace delivered that letter. I am quite happy with the reception so far. The printed magazine is almost sold out. I saw to it that the major book shops in Phnom Penh would carry it. We had presentations of the magazine in a couple of places in Phnom Penh, and got invited to talk about Cambodian cinema in Vientiane and Hanoi, and there might be more in the pipeline. (To my surprise, nobody has invited us to Malaysia yet, though 🙂 ) [ed: We’ll see about changing that in the near future…] Again, there is this dearth of material on Cambodian cinema, from which we benefit. Like ‘Kon’, I notice that your book ‘Kino-Sine: Philippine-German Cinema Relations’ is also available for download. Can you tell us a little bit about that book as well? That was a book that was commissioned by Goethe Institut in Manila, when I was living there. During the 1980s, they had invited a good number of German filmmakers to Manila, and their workshops and lectures had an important impact on the independent film scene of that time. People like Raymond Red, Lav Diaz, Nick Deocampo or Roxlee, who became important film makers, participated in these events, and these events really provided a platform and logistical and financial support for the burgeoning scene of young filmmakers in Manila at that time. Back then, there was no independent film in any other country in South East Asia. People worked with Super 8 and analog video, not the cheap and accessible digital video of today. The Goethe Institut wanted to publish a book on this period, but I did not feel that I was doing a PR work for them. Their contribution really was very important, and is fondly remembered even today. What sets the Goethe-Institut apart from other similar institutions? While I am aware of a strong presence by the likes of the British Council and Alliance Francaise, they don’t seem to be fostering such relations in a similar way. 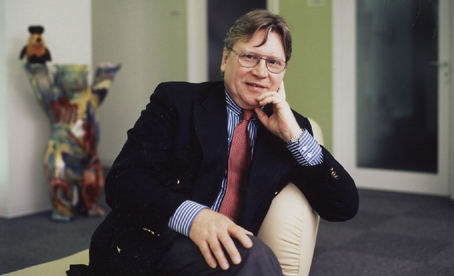 This period of workshops with German directors in the Philippines was really due to their then-director, Uwe Schmelter. This kind of activities always has a lot to do with individuals. Right now, the Goethe Institut supports documentary filmmakers in the region. I think they have understood that if you just present your own culture in foreign countries, it can become a bit sterile and self-serving. Especially in developing countries, it can be much more fruitful to engage with the local arts community. I suppose it can be inferred that German films are well-regarded in the Philippines, but how true is the reverse? With more filmmakers from the Philippines (and South East Asia) becoming more acclaimed in their own right, would German (and European) audiences be able appreciate South East Asian filmmakers in a similar way? Well, the last two films [‘Kinatay’ and ‘Lola’] by Filipino director Brillante Mendoza were released theatrically in Germany, something that has never happened before. Mendoza, Lav Diaz and Apichatpong Weerasethakul were invited for their first retrospectives to cinemas in Germany. I often think that these new indie filmmakers from South East Asia are more appreciated in Europe than in their own countries. Some of them say so themselves. While Cambodia and the Philippines are a lot closer to Malaysia compared to Korea and Japan, I have a more difficult time trying to watch Cambodian films than I do Korean ones. Sometimes, I feel as if we’re missing a trick by not officially bringing in films from neighboring countries. Well, right now, there are almost no Cambodian films to watch, so you are not missing out much. But I find it quite noticeable that in South East Asia, there is little interest in films from neighboring countries. When I lived in the Philippines, I do not recall any film from another ASEAN country that was released theatrically, even though films like ‘Iron Ladies’, ‘Beautiful Boxer’ and the martial arts films by Tony Jaa were cult films on the pirate market. Distribution might be an issue here, but there also seems a lot work to be done in terms of cultural integration in the ASEAN countries. ‘Lost Loves’ by Chhay Bora. I guess a part of your response above answered the following question: what kind of position is the Cambodian film industry in right now? The state of Cambodian cinema right now is very sad. There is only one cinema left in Phnom Penh. There is movie piracy, and beyond that, people watch films on TV and are not ready to pay for the experience. Then again, most of them are very poor, and basically there is no market for new films. The few films that get produced are mostly bad horror films. A notable exception is the new movie ‘Lost Loves’ by Chhay Bora, a family saga under the Khmer Rouge, but so far, it has not been released theatrically. There are also very good documentaries, but, again, they seem to get shown abroad more than in the country. Cambodia, with its storied history, has had a lot of outside forces playing major roles in the country. How have these influenced Cambodian films as a whole? This is a very interesting topic. Before the Khmer Rouge, they showed films from the US, Europe, Thailand, Japan, Hong Kong, India, even Cuba and Mexico here. I even found an newspaper ad for the first pontianak film from Malaysia in an old newspaper. Especially, the Indian mythologicals had a strong influence on the Cambodian films of the 1960s. 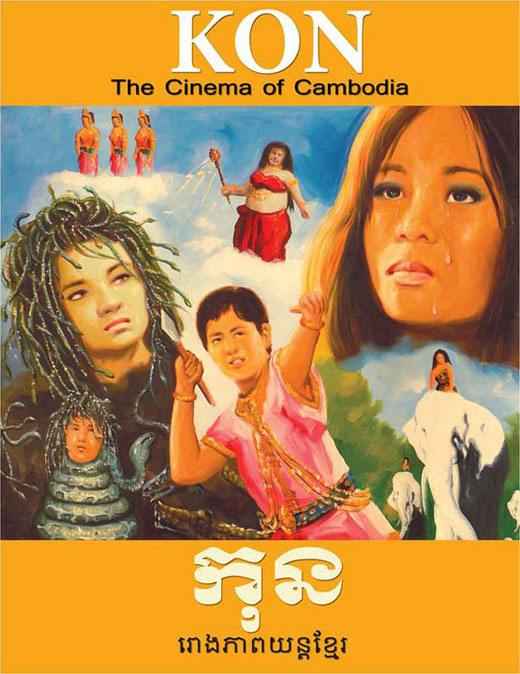 It could even be argued that the Cambodian films of the Golden Age before the Khmer are examples of a transnational cinema. At the same time, they are distinctively Khmer, very fascinating. 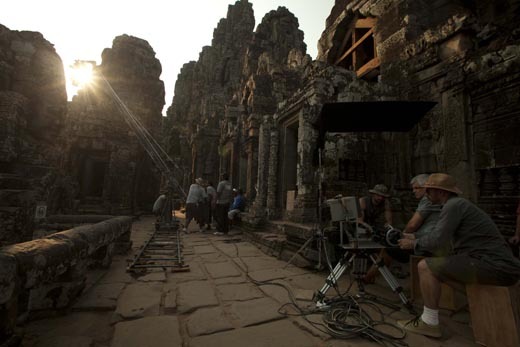 For now, there has been a number of international films shot partly or fully in Cambodia, such as ‘Tomb Raider’, ‘Transformers 3’ and ‘City of Ghosts’. What are the prospects of international co-productions being made in Cambodia with Cambodian filmmakers? Generally speaking, today many films that represent certain countries in the international film circuit, are transnational co-production. For instance, many people think of Anh Hung Tran, if they think of Vietnamese cinema, but the films that made him famous were financed by French companies, and ‘Cyclo’ was even banned in Vietnam. 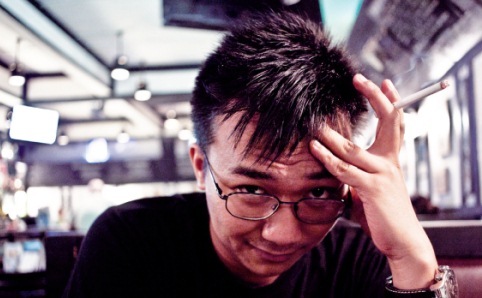 I do not really see him primarily as a Vietnamese filmmaker. But Vietnamese cinema is weird in that sense anyway, as most successful filmmakers there today seem to be Việt Kiều. This leads nicely into the next question: is it important for a film to be a Cambodian or Asian film? How possible is it to consider these films are just films? I have put together a new book that should come out in autumn with Hong Kong University Press, which deals with this question. It is called ‘Independent Cinema from Southeast Asia in the Global Mediascape’, and I am looking at how the filmmakers from South East Asia are circulating their films in the international realm, as most of them do not have a big audience in their respective countries. There is, however, the transnational realm of film festivals, DVD distribution, Internet downloads and streaming, where many of these filmmakers do quite well. Many of these productions have been sponsored by international funding bodies, so we have a truly transnational independent cinema. That is particularly amazing considering the fact that a good decade ago, South East Asian cinema was a non-entity in the international film world. Having said that, I also feel bad about how shabby many indie directors are treated in their own countries. Just think of Amir Muhammad, who had three films banned in Malaysia. I also do not understand the apathy that the audience displays towards many of these films. Apichatpong wins in Cannes, and then one cinema in Bangkok shows his film, and half of the audience are foreigners! You would think that countries like Thailand or Malaysia have a middle class that supports this kind of leftfield film making, but no. It is a bit sad, because cinema has always been one factor in shaping national identities, especially in South East Asia. In the Philippines, you had a film star that became president, and in Malaysia, you had a prime minister who wrote scripts for movies! (And for the Shaw Brothers, can you believe it!) I think it is important for any country to have cinema as a medium of discourse, not just dumb television soap operas, newspapers, and blogs. Similarly, what do you think about the label ‘digital’ or ‘independent’ film? What kind of impact does it have on the film and/or the filmmaker to be considered as such? The term “independent cinema” is so vague, that I really should stop using it. The “digital” film of today is really an entr’acte in the history of cinema. In a very foreseeable future, digital films will not have that specific pixelated look anymore that is characteristic for the Indie films from Southeast Asia at this point. To talk about a “digital film” in a way already is an anachronism, just like talking about “electronic music”. Just as all music is electronic these days, even films that were shot on film are post-produced in digital before they are put out on film again. Furthermore, films that are shot with advanced digital cameras like the RED ONE already are almost impossible to distinguish from films that were shot on celluloid. So in a way, the look of the indie films from Southeast Asia right now is like the blurry black and white analog video that once determined the look of video art circa 1975. It will soon be possible to date a film by its look as a indie film from the early 21st century, as the films that will be made in the next couple of years will look much more “film-like” again. In a way I am disappointed how little the filmmakers of Southeast Asia made out of the specific qualities of digital video. OK, it enabled them to make films in the first place. But other then wildly toting the small cameras around, they did not experiment much with the specific qualities of digital video, e.g. the amazing depth of field or the specific way digital cameras can deal with dark sets. There is an aesthetic aspect to this as well: in an article for the Inquirer in 2006, you wrote that “digital movies are seen as a way out of the local film industry’s usual fare of often formulaic productions.” Reading that, I feel that you are clearly demarcating the mainstream from the independent by the format, the style, rather than its substance. Is it possible that independent filmmakers make formulaic films for money via the digital format? That is a very difficult question. It is noticeable that many indie films that come out of Southeast Asia share a number of common traits: long takes, slow storytelling, a neorealist focus on the mundane and quotidian. There is nothing wrong with this, but I am sometimes surprised that so many young film makers subscribe to an aesthetics that is very much in line with what film critics consider to be good film making. Often there is something “filmschoolish” about these films. Why aren’t there more films like Khairil M. Bahar’s ‘Ciplak’? That was an independent film from Malaysia, shot for 5000 dollars. It was fast, funny and seemed to talk about topics that people in their twenties would be interested it: piracy, cult movies, rock, love. It was even released in a shopping mall cinema in Kuala Lumpur. Yet, it was more or less ignored by critics, and did not become part of the canon of indie films from Southeast Asia. Maybe it was because ‘Ciplak’ wasn’t easily available, either officially or otherwise. Apart from financial issues, how important is the piracy of films in South East Asia? What would happen if there are no pirated films available? If piracy brings interesting films to the region, I am all for it. The media market here is still very underdeveloped, and there is simply no other way to get films from art house directors, as they are not for sale in the shops. I do see, however, how piracy has been a very destructive force for the local film industries in many countries in the region, so I am hesitant in supporting it. And of course, I think that creators should be compensated for their artistic and intellectual work. However, as far as art house film is concerned, I think the losses that filmmakers had to suffer because of pirated films in Southeast Asia are small. Dr Tilman Baumgärtel runs the Southeast Asian Film Studies Institute, a website serving as a resource on South East Asian cinema. We previously posted ’10 Khmer Films You Should Know’, which was taken from ‘KON: The Cinema of Cambodia’. Next What’s up with film education?